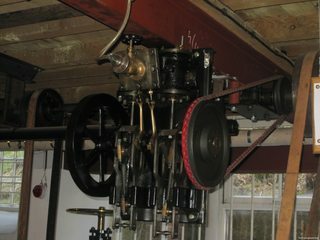 These small steam engines were used as you would an electric motor today to power all sort of machinery, my model horizontal mill engine that a few of you have built is actually based on a small mill rite's engine that's on display at the Northern mill engine societies museum at Bolton thia engine would sit on top of your desk they would move it about to wherever they needed power such as the re-boring of a large mill engines cylinders. 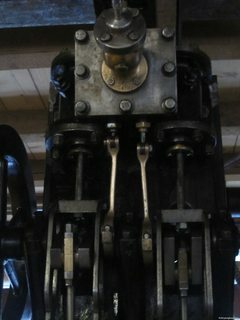 Any way these are all my old photographs i took of the over crank including some of the machinery it was powering. 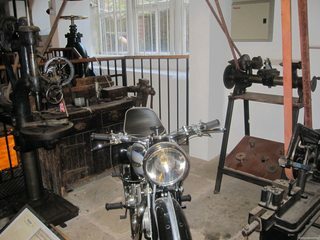 I don't believe the engine was originally at Quarry Bank I suppose they found it some ware and decided it would make a good display for the museum. I sorted out how to assemble the block from aluminum bar stock but my regular camera was dead and the only camera I had was my phone. I got a few shots of the results but I have never uploaded to the forum from my phone so this is sort of a test. I was able to upload as an attachment but I was not able to imbed it in the text. That's something I will have to work out. In the photo, it looks a little strange. The loose aluminum block on top will be joined to the rest of the assembly and will be milled to the angle required for the valve chest. I have left it loose to make it easier to route the steam passages (I think) without having to plug holes later. Those details are being worked out now. The lower block looks like a single piece but it is assembled from four pieces of 1/2" thick aluminum bar that will be glued with steel filled two part epoxy (JB Weld). I have had both good and bad experience with this product. I think you should buy a fresh supply for a critical application like this. Don't use the half used tubes that have been in the drawer for 6 months, and be sure to mix it thoroughly. I may reinforce the assembly with screws but if I do I will wait until the epoxy has cured for a couple of days and I will use brass screws just incase I drill into one as I go further. 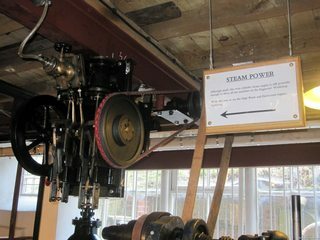 I don't think that the very large valve you asked about is anything to do with the display of a millwright's workshop, it's bigger than the engine and outside the display area. I can't remember anything about it from my visit. Thanks for the additional pictures. The second picture has made me realize that I had the proportions all wrong. I have the cylinders too far apart. Not sure why but it may have to do with a wrong starting point in my planning, but it seems that the cylinders should be closer by 3/4 of an inch. My error would have been more apparent if I had started my planning with the crankshaft. My present spacing puts way to much unnecessary spacing. I am going to attempt a heroic save of the cylinder block above. These things seldom work out well so I am prepared to scrap this and start over. I’ll catch up on the build later, but, for now I’d just like to welcome you back to port Captain . I hoped you hadn’t been lost at sea. You have any equine stock now? I’ll be following along on this voyage for sure. Hi Whiskey. Thanks for the shout. Trying to get back into the swing of things. My animal buddies are just a couple of dogs these days. All the horses have been moved out to my daughter's training center where there is a lot more space and help to take care of them. I lost a coupe of my dog buddies this year. One of them had been suffering from spinal problems from the day we found him. Not sure if it was a birth defect but I suspect it was from abuse and neglect, He had good days and bad and one morning he didn't show up for breakfast. I found him where he had dragged himself under the bushes behind his house. Live but tired of living, his back legs completely paralyzed. I spent the day with him but the next day we had to help him leave. His sister had been suffering for several years with general poor health. After her brother died she gave up too. She would not eat and then she would not get out of her bed in the barn. Within a few weeks, she was gone too. It is rough to say good by to your friends, but at least you can rest easy knowing that you gave them the best life that you could. Sorry to hear Jerry, its never easy. Ahh man sorry to hear that Jerry, it's never easy letting them go. Oops, battery failing. I will finish this post when I find my charger cord. I hope everyone enjoyed the holidays. Lots of family time, not much shop time but now back at it. I am slowly remembering things that I thought I new. For example, converting someone else's metric plans to imperial is more than just converting mm > in. Once you change a critical dimension to standard sizes and eliminate rounding, everything else is up for grabs, and if you also make a change to allow for available material, you might as well start from scratch. The holidays did allow me some late night design time after everyone else was in bed so I have come up with this as a model within the range of my equipment and experience. I still need to design some of the finer details but this is a working video is what I am going back to the shop with. 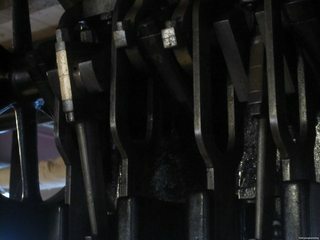 I am aware that the valve timing on the right hand cylinder is out of sync but that is easier to adjust in the shop than it is on the computer. The valve cover is slid off so I can check the action. I am making headway on this project but my reporting efforts have been poor. Partly because I seem to have difficulty sticking to a plan of action, and partly because I have not yet been able to work out a simple method of inserting pictures within the text so I am stuck with using attachments which make it difficult to follow. Another problem is that this computer, which has more disk storage space than I ever thought I could use is now full of thousands of family photos, CAD files,and other things that I can not bring myself to delete So I am battling a serious problem with creating new designs and processing photographs. But stick with me if you can. I will get better, I hope. The first attached picture is the condition of the cylinder assemble as of now. It is mostly assembled from aluminum bar, which I had on hand. The cylinders are from cast iron bar. This will be filled and painted to hide seams and joints so that I can pass it off as if from a single casting. 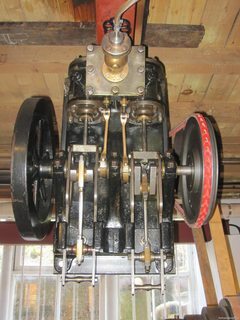 The second attachment shows the valve cover removed (no bolts yet) and the valve bodies can be seen. When they are removed as in the third attachment, you can see that the work against a brass valve plate that is set into the aluminum base. If you look carefully, you will see that I am still able to create hockey sticks in the valve plate, and If you look closer you can see the top of a broken tap that had to be ground flush. These next three photos will show how the valve base and porting are put together. Beneath the valve plate, holes are drilled through the valve base and with the valve base lifted, you can see that these holes intersect milled channels in the top surface of the main block. 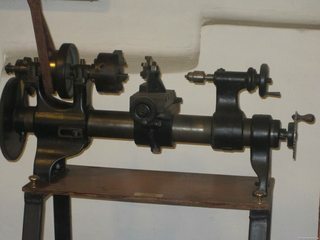 These channels are connected to vertical holes that intersect with the surface of the cast iron cylinder, just behind the flange. The final part of this is a slot that is milled into the cylinder and then a final hole drilled through the slot into the vertical hole. If this works as planned there will be no plugged holes and all of the passages are internal. 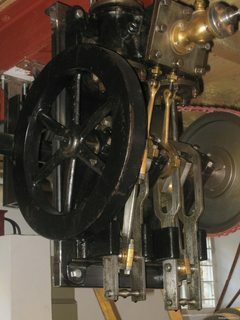 The exhaust ports combine and connect to a straight hole through the valve base, the top plate of the main block and exit into the large open section between the cylinders. At present, all of the aluminum plates are screwed together. I plan to bond them permanently with JB Weld but I may wait until I can do an operational test before making the permanent commitment. Good progress Jerry interesting that you are using ally I made mine from brass but ally held together with screws/JB weld will be just as good. To stop making hockey stick ends in slots simply drill a hole just a tad larger than the slot this will stop the cutter pulling into the corner and the size difference won't matter a jot. Thanks for the comments. I may take some different approaches to the development of this model because of my limited equipment and experience. And also I doubt that i could actually produce parts to specification so I have to make adjustments. And sometimes I let my mistakes lead the way. There are two big differences between brass and ally for this job. One is dollars and the other is that i have ally. Paint will make it work. I have some bronze on hand that i thought might work for the heads but I don't like the color much; particularly when brass will be used for piping and valves. I have at last worked out a method of getting my photos imbedded so my next progress report may be easier to follow. Following along Jerry! keep it coming! Bad Behavior has blocked 16964 access attempts in the last 7 days.